"To Doug and Sharon - Thanks!" After a fairly long and grueling day of wrestling with guitars, arguing with the UPS delivery guy and a whole host of other things (it was just a bad day), I was standing in the shop talking to a client while I had another client waiting in my office. The phone rang - I decided to let the answering machine get it - I really didn't feel like juggling two clients and a call from some telecommunications company asking if I wanted to save money on my long distance bills - all at the same time. heard the answering machine beep and someone began talking and I went back to my conversation - my other client (in the office) shouted - "hey Doug - You might want to get this!" I walked in the office and asked what's the matter? 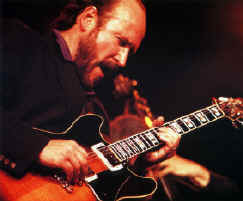 Rocco (my client) said - Someone's on the phone who say's he's John Scofield! - As you can imaging - I picked up the phone - after knocking over Rocco to get to it. "Hello? - can I help you?" "Hi - is this Doug?" 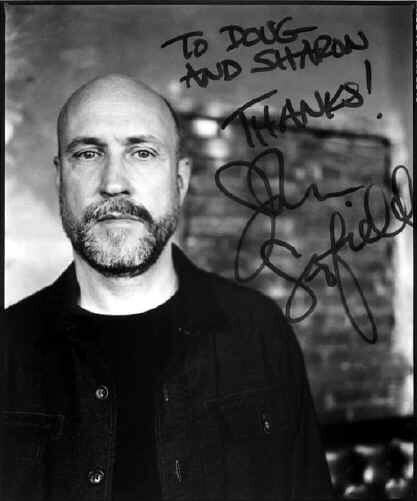 "Hi - This is John Scofield." "This is a joke - right?" After he had a little laugh at my expense we went on to talking about him needing some guitar work done. He said he had heard of me and the work we did for many years and had finally gotten around to picking up the phone - He also told me that he knew that I did John Abercrombie's work and that he suggested that he call me (remind me to call John Abercrombie and thank him). 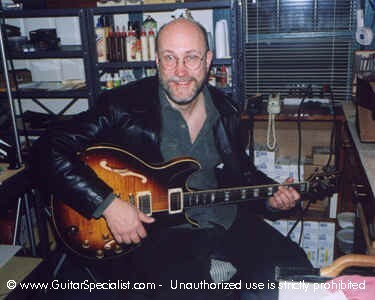 John Scofield showed up at the shop the next morning with a guitar that needed quite a bit of TLC. (more about this a John's page in the "repairs" section). It was quite an experience to be standing there with John Scofield talking to him about this guitar that I'd heard on so many recordings - It was quite a thrill. Here's John at our shop in March, 2000. We took care of the de-lamination on the top of is Ibanez. He is one hell of a player as well as one of the nicest guys you could meet. 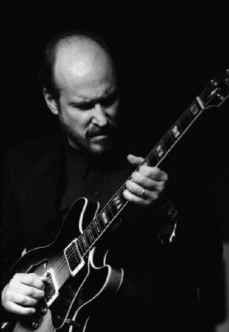 "It's hard to put a level on my music, like jazz of fusion", says guitarist John Scofield. "It's instrumental music that has one foot in the jazz tradition and the other in the popular traditions, especially rhythm and blues. You know, jazz musicians don't live in a vacuum where they only hear jazz". A veteran sideman (whose credits include, most notably three years touring and recording with Miles Davis), Scofield has developed a formidable career as a bandleader in his own right. Never quite fitting into the typical definition of jazz fusion, the guitarist has worked his favorite aspects of jazz, blues, rock and country into a personal style that is uncompromisingly original. His new Quartet embraces his musical loves and complements them with fresh exploration of jazz traditions. 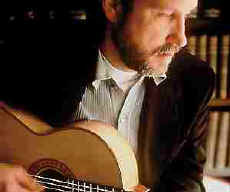 The guitarist's career has demonstrated a versatility as diverse as his musical influences. Raised in Wilton, Connecticut, in 1951, the young Scofield absorbed sounds and style from all sources; from The Beatles to John Coltrane. After attending the Berklee School of Music, he moved quickly into the public eye when he began playing with Gerry Mulligan in 1974. In years following, larger audiences heard Scofield in the fusionesque George Duke/Billy Cobham Band. As the guitarist performed as a sideman with prestigious bandleaders, he simultaneously launched his solo career in Europe. 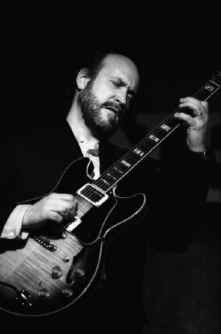 Scofield enjoyed immediate success in a variety of musical configurations, the most popular being a trio with Steve Swallow and Adam Nussbaum. His historic association with Miles Davis from '82 to '85 enlarged his personal profile enough for him to break away from sideman work and concentrate fully on own endeavors. His funk-oriented band with Dennis Chambers became one of the most popular electric/instru- mental bands in the recent years. The John Scofield Quartet, the latest chapter in the continuing development of Scofield's solo career, is a marked departure from the electric band and musical styles featured in the last few years. Using the talents of Joe Lovano on tenor-saxophone, bassist Anthony Cox and drummer John Riley, Scofield sets out to showcase a collection of new compositions. He explains:" All of these tunes were written with this instrumentation in mind. The result is a project with more 'jazz' elements than some of my earlier groups, but I haven't sacrificed diversity. In writing, I tried to leave room for interpretation by the other musicians. Each of my musical influences are still represented fully". Joe Lovano is highly featured in the quartet, sharing the soloing responsibilities equally with Scofield. Lovano has become one of the most respected and sought-after tenor-players in Jazz today, contributing over the years to the recordings and performances of Paul Motian, Elvin Jones, John Abercrombie, Carla Bley and Charlie Haden, just to name a few. Lovano and Scofield share a very compatible approach to music and their unity is the most compelling feature to the band. Drummer John Riley has shared bandstands with a wide range of musicians: from Jazz mainstays like Stan Getz, Red Rodney and Dizzy Gillespie, to the energetic ensembles of leaders like John Abercrombie , Gary Peacock, Randy Brecker and Dave Liebman. As both a player and an educator, Riley stands out in his musicianship. Anthony Cox has played a lot of "straight ahead" jazz during his career, but swings equally as well in the more avant-garde arena. He's performed and recorded with Elvin Jones, James Newton, David Murray, Henry Threadgill, Arthure Blythe, Jon Faddis and Sam Rivers, among many. 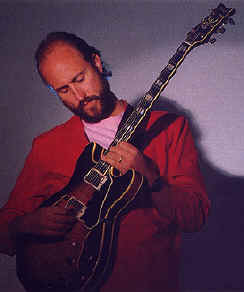 nobody grooves like John Scofield. Here's John wit his infamous Ibanez Artist. He told me that Ibanez is going to re-introduce the model as The John Scofield Model after they redesign the guitar to his specs. He's been so closely associated with this guitar for almost twenty years - I think it's about time.